EasyCart comes with a powerful abandoned cart feature built into it. 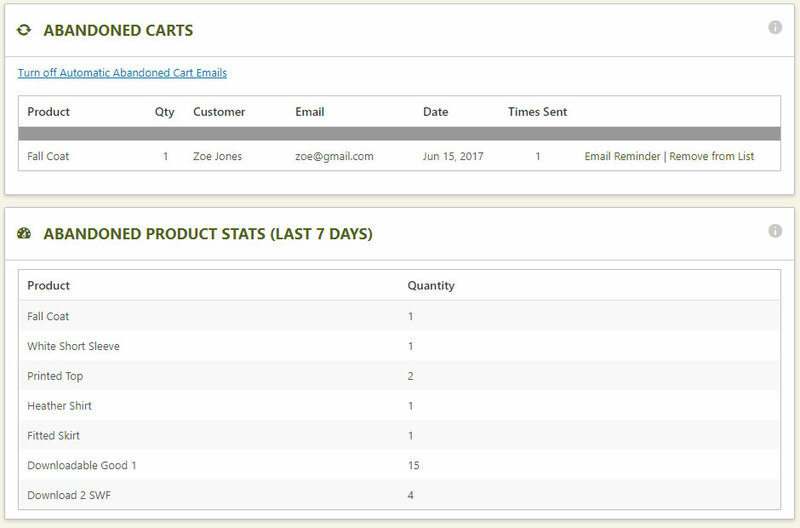 If users checkout and then abandon their cart, they can still be reminded of their cart contents after the fact by sending a quick reminder. Abandoned Emails will be sent to the user 3 days after they left their cart and simply remind them they have contents in their cart, be sure to checkout. Simply select to turn on and off the system using the first link button. You get a log below of the emails that have been sent and how many times in case you wanted to look up a user. You may also specifically send another reminder to the user, or you may remove that user from the list all together. Statistics show a brief overview of the products that have been abandoned for the past 7 days (1 week) period. This may give you an idea if there is a specific product the users are abandoning and you may want to take specific action on a product, or it could indicate completely random abandoned carts.